We have the poster above hanging on the walls at TC Towers, and it was with a start that I realized we were fast approaching the tenth anniversary of its release. Doesn’t time fly? I was somewhat embarrassed to discover, despite it decorating our home, I didn’t actually have a copy of the movie. But there was enough time to get the BluRay, and so, on Saturday night, we sat down to watch the whole enchilada – as we had done in the cinema back in 2007. How would it fare? The answer is, reasonably, perhaps surprisingly, well. While we’ll get into more specifics shortly, the tl;dr is this: My conclusion at the time of original release, that Planet Terror was undeniably the stronger of the two, remains the case now. It does a better job of capturing the grindhouse spirit, and even in a market now arguably over-saturated with zombie fare, does enough to stand out from the shambling pack. Death Proof is great… when it gets going, and will always have a place in our hearts, for introducing us to the great and glorious talent that is Zoë Bell. That first 45 minutes though? Excruciatingly bad. 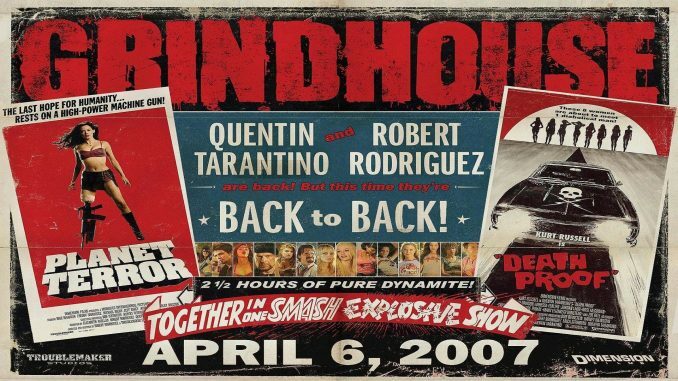 But what makes Grindhouse memorable is not just the features, it was the effort made to create an entire throwback, drive-in experience. Missing reels, damaged film, even semi-random title changes (Death Proof opens with a flash frame of its “real” title, Thunderbolt, before the “changed” one appears). If it was recreating a virtually lost era in 2007, that’s all the more so now, with barely three hundred drive-ins left in America, 20% fewer than at the time of release. Yet it still resonated with fans and film-makers. If not as successful as hoped at the box-office, it did spawn a grindhouse revival, with a number of other films, directly or indirectly influenced and seeking to invoke the same spirit, from Hobo With A Shotgun to Piranha 3D. It’s here in the “intermission” we find the bulk of the trailers, each the product of a guest director. It begins with the one I most want to see: Rob Zombie’s Werewolf Women of the S.S. with its glorious cast: Nicolas Cage (as Fu Manchu! ), Udo Kier, Bill Moseley, Sheri Moon Zombie and even Sybil Danning, marking her first movie role in close to two decades. It’s approximately a Jeffrey Combs away from being perfect. Edgar Wright’s Don’t may be less star-studded (though I was amused to see Nick Frost as the adult baby, among other cameos by Wright regulars), and nor did it leave me hoping desperately for the trailer to become a real movie. However, it delivers the grubby spirit and feel of those cheap seventies British horror films.